and Andrew Smith, a non-lawyer. 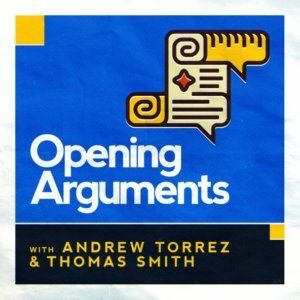 I like this mix of lawyer and non-lawyer, because Smith asks good, smart questions and Torrez gives well-researched and intelligent answers but never seems to talk down to Smith or to the listener. At the end of each episode is a fun segment called Thomas Takes the Bar Exam, or TTTBE. It’s basically just what it sounds like – Andrew reads Thomas a question from the multistate bar exam, and Thomas (the non-lawyer) tries to answer. It really drives home to me two things: First, that much of the law makes no logical sense unless you’ve studied it, and second, that I’ve pretty much forgotten property law (contrary to popular belief, most lawyers are not experts in all areas of law)! One caveat: the hosts have a bit of a liberal bias (although they do call out both sides when necessary), so if that is not your thing, this may not be the podcast for you. If you do find this premise fascinating, click here to learn more or subscribe. Let me know what you think! And check back in next Monday to find out what my #4 most favorite legal podcast is!